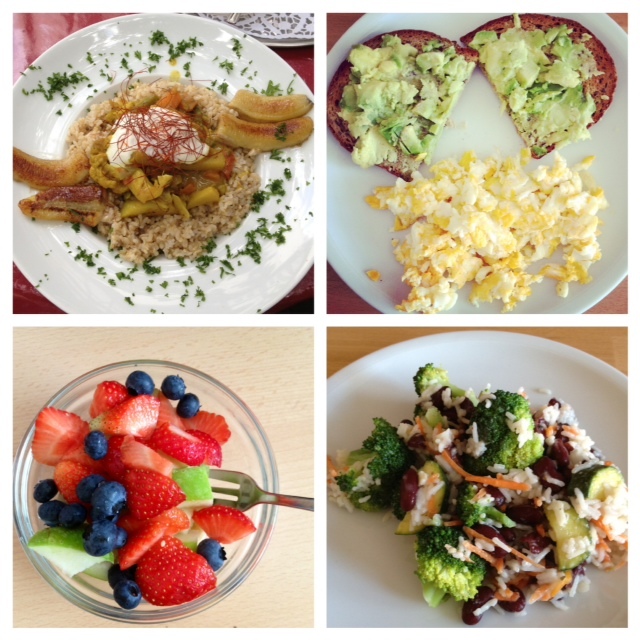 Anyway, here is a quick look at what I've made/eaten in the past few weeks. I find that I'm gravitating more towards a vegetarian diet once again. When it comes to what diet to follow I think it's just best to go with what you feel good eating, and avoid depriving yourself of anything you crave. Lately, I just don't want to eat meat, so I don't (for now). * So do what feels good, right? Clockwise from top left we have: a vegetarian curry dish featuring a favorite love of mine- fried plantains, then an easy breakfast of 3 eggs, 1 egg white and mashed avocado on flax toast. Up next there's broccoli, kidney beans, carrots and zucchini tossed in basmati rice, and lastly a fresh fruit salad for breakfast with juicy blueberries, strawberries and some green apple bits. *This post was written a few days ago. Last night I made salmon for dinner. And had chicken the night before. So maybe I'm eating meat once again?